Inspired by the Little Read Hen, we have made and baked bread rolls. The children mixed their own ingredients and then kneaded the dough. Mrs Kildea taught us the push and pull method. We then let the rolls prove over lunchtime and baked them in the oven after lunch. If the children wanted to they independently spread their own butter on the rolls. The children then all tasted their bread rolls while they were still warm. We thoroughly enjoyed out first dance lesson with our new dance teacher Miss Debbie. 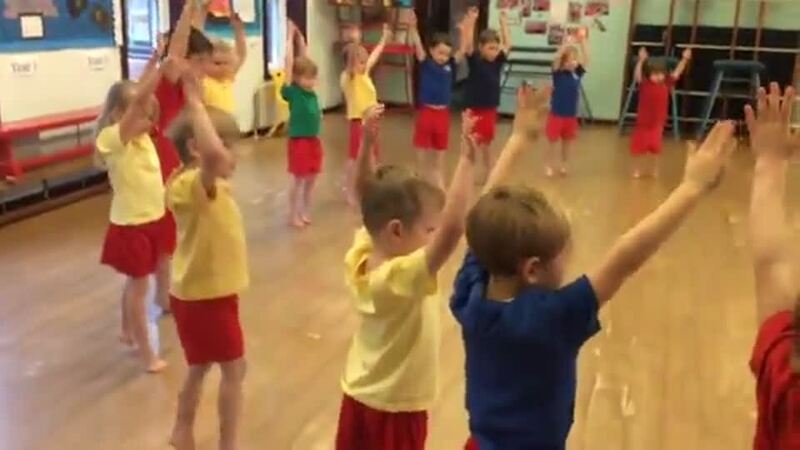 We played some warm-up games, practised our jumping, hopping and skipping and danced to Baby Shark. As part of the our topic 'What's on the menu?' we have been reading the story Supertato. We discovered a note from Supertato which said that he had been captured by The Evil Pea. So we decided to become superheroes to help save him. Mrs Macdonald helped us to make a superhero background. We used different superhero props to help us.